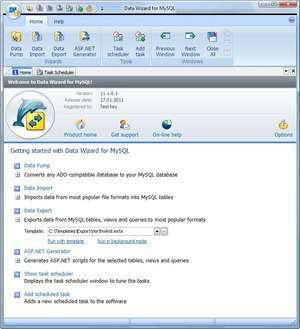 Data Wizard for MySQL is a powerful Windows GUI utility for managing your MySQL data. It provides you with a number of easy-to-use wizards for performing data manipulation easily and quickly. Data Wizard allows you to generate ASP.NET/PHP scripts for the selected tables and queries, convert any ADO-compatible database to the MySQL database, export data from MySQL tables and queries to most popular formats, and import data into the tables. Data Wizard for MySQL 13.12 is a shareware program and can be used as a demo to try the software until the free trial period has ended. A full version of the program is available after the trial period ends. For security reasons, you should also check out the Data Wizard for MySQL download at LO4D.com which includes virus and malware tests. Additional screenshots of this application download may be available, too. Easily manage your SQL or Oracle database in Windows with this handy applications. Great for reducing queries, building and optimizing queries and more. Freeware and share programs are included. Check out some of the freeware downloads available in the db tool category. They contain no strings and are available at zero cost.